To be performed on suitable avulsed incisors with extra-alveolar time greater than 5 minutes. For extra-alveolar time of 5–60 minutes with the tooth stored in a physiologic medium (e.g., chilled milk, tissue culture media), ligament cells may remain viable but lose the ability to form periodontal ligament. Ankylosis is a likely outcome. For extra-alveolar time > 60 minutes, the root side ligament is necrotic. Ankylosis is the predictable outcome. Assess the patient's medical history and current neurological status. 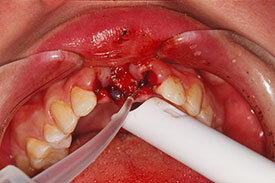 Clinically examine the wound, and the avulsed tooth and supporting structures. Inquire about the history of trauma, extra-alveolar duration and storage conditions of tooth. Perform sufficient imaging to survey the area of trauma. 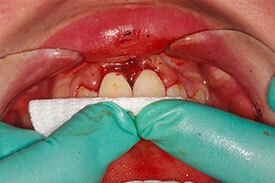 Traumatic exarticulation of an incisor with an extra-alveolar time > 5 minutes. The decision to replant is reversible: it allows for more time to assess other available options and plan for eventual loss of replanted tooth or teeth. Inform the patient/parents of the likely outcome for replantation: ankylosis and eventual tooth loss due to replacement resorption. Inform the patient/parents that the local periodontal architecture will be affected whether or not the tooth is replanted. Obtain informed consent, which should include the likely outcomes of replacement resorption and ankylosis. If the patient/parents decline replantation, oral wound care should be provided. Administer local anesthetic, suction any blood clots from the socket, debride wound, and gently rinse the tooth with saline or water (Fig. 1). Replant the tooth in the socket and stabilize it by having the patient occlude on a wax wafer (Fig. 2). 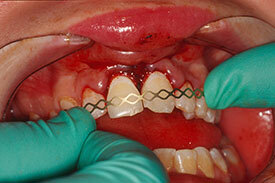 Splint the tooth with a semi-rigid splint that is acid-etch bonded to 2 teeth on either side, if possible (Fig. 3). 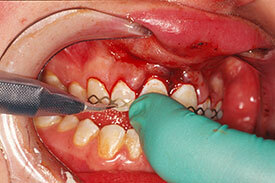 Secure the avulsed tooth to the splint last (Fig. 4). Verify the position of the replanted tooth with a periapical radiograph. Suture any soft tissue lacerations. Remove pulp immediately upon replantation, or within 14 days for mature roots. You may wait for evidence of pulp revascularization for teeth with immature roots. The use of chlorhexidine mouth rinse during splinting is elective. If significant lacerations are present, defer elective chlorhexidine rinse for 48 hours. Systemic antibiotic therapy is not routinely required. Reassess the patient in 7–14 days. It is not necessary to take radiographs. As the intended outcome is periodontal ligament regeneration, minor mobility of the traumatized tooth is acceptable, and the splint can be removed after 2?weeks. If the tooth exhibits severe (M3) mobility: the splint should remain. Reassess the patient in 5–7 days. If ankylosis is detected: consider early referral. A multidisciplinary approach for medium- and long-term management may be indicated due to the complexity of managing this clinical situation through adolescence. Figure 1. Preparation for delayed replantation. Gentle removal of bloods clots from the sockets by irrigation and suction. Figure 2. Teeth replanted in sockets using manual pressure. Figure 3.Preparation of semi-rigid splint for bonding to affected teeth and (where possible) 2 teeth on either side of the avulsed incisors. Figure 4.Bonding of semi-rigid splint to affected arch. This is an alternative to waiting up to 14?days for the removal of the dental pulp. Immediate extraoral root canal treatment reduces the risk of inflammatory external root resorption, and allows for periodontal ligament removal prior to replantation. The removal of necrotic ligament is consistent with the principles of wound management, and may speed the resorption process. The ligament can be removed with slurry of flour of pumice prior to replantation, if desired. Suction any blood clots from the socket. Replant the tooth in the socket and stabilize the tooth by having the patient occlude on a wax wafer or similar. Splint the tooth with a semi-rigid splint that is acid-etch bonded to at least 2 teeth on either side of the avulsed tooth, if possible. Secure the replanted tooth to the splint last. Verify position of the replanted tooth with a periapical radiograph. As ankylosis is anticipated, the splint should be retained for 4 weeks. Dr. Casas is director of clinics in the department of dentistry at The Hospital for Sick Children in Toronto. He is also an associate professor in the faculty of dentistry at the University of Toronto and is a director of the Ontario Cleft Lip and Palate/Craniofacial Dental Program. The author has no declared financial interests. Kenny DJ. New dental trauma guidelines for permanent teeth: a perspective. J Can Dent Assoc. 2012;78:c86.